Rainbows are the youngest girl group, aged from five to seven. 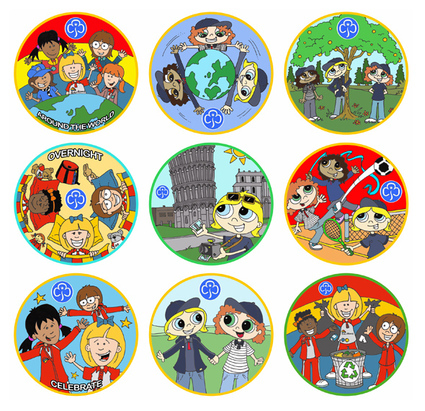 Especially for the Rainbows there is the Rainbow Jigsaw programme which promotes lots of activities for girls within this age group and caters for all levels of capability. During these early development years it is important for children to take part in activities that help develop their self confidence, that their ability to make new friends is encouraged and the necessary tools are put in place to encourage and facilitate learning. 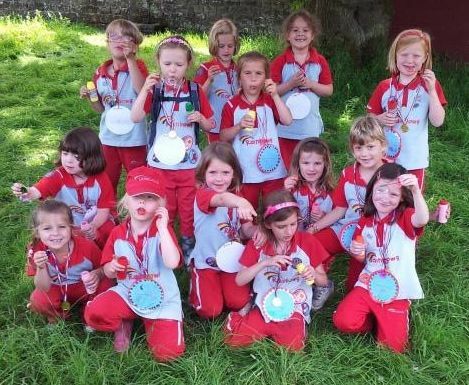 At Rainbows Girl Guiding all these targets are set as a priority, with fun activities utilised to achieve these aims – learning by doing is a strong methodology, and one heavily promoted at Rainbows. New members will usually be welcomed with a welcome bag containing a Rainbow flip book. This book introduces new girls to Rainbows Girl Guiding in a fun way with activities such as colouring and drawing and stories. This is the first time new girls will meet Olivia! 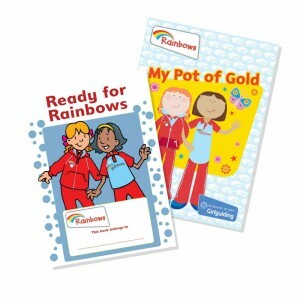 There may also be badges to earn, make sure and ask about these as new Rainbows love collecting badges! 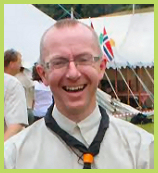 The framework used by Rainbows to achieve the above aims is called the Rainbow Jigsaw and it comprises four parts. When we encourage Rainbow’s to Look we hope they will appreciate the wonder of everything that is around them, from their close and tactile experiences, through to an appreciation of the wider world and what it has to offer all girls including Rainbows and Guides. Through looking Rainbows will learn and appreciate the communities they live in and the environment they enjoy and can help shape. Learning is a large part of what we do at Rainbows, and we achieve this through a variety of activities designed to encourage learning through fun. Activities include experimenting with cooking and arts & crafts. Rainbows will also enjoy trips to places of interest and have the opportunity to learn from visiting associates such as a police officer or careers advisor. Laughing is an expression of having fun, and if Rainbows are having fun one of our objectives is achieved! We actively encourage a happy and fun atmosphere that promotes a high level of engagement and laughter. This is achieved through organising parties, games and parties. Finally, Love: Through Rainbows we help young girls learn about the importance and value in caring and sharing with family and friends. As young girls reach the point where they can progress to Brownies, they can explore the My Pot of Gold page in their flip book. This is usually a group exercise as it is not unusual for a group of Rainbow;s to transfer to Brownies at the same time. Rainbows will be helped through this transition by a Leader. This will usually include organising a Pot of Gold party! 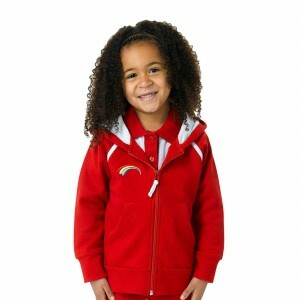 To see our most popular Rainbow gift, take a look at the Rainbow Hooded Jacket!